A year ago, the L.A. City neighborhood of Silver Lake appeared to be facing serious threats to street safety. The half-mile Rowena Avenue road diet had been criticized by a vocal cadre who called for it to be un-done, removing safety improvements, taking away bike lanes, and adding car capacity. These traffic safety deniers had held sway in closed-door advisory committees, the Silver Lake Neighborhood Council, and appeared to have the ear of the area’s City Councilmember David Ryu, who killed a planned road diet in another part of his district. Ryu commissioned a secretive study that appeared to lay the groundwork for removing the Rowena road diet. Silver Lake community leaders came together to push for street safety. Keep Rowena Safe has been active in refuting unfounded road diet criticism. In the past month, the community tone has changed; neighborhood discussions are shifting from defending existing safety improvements, and instead looking to expand them. The April 6 Silver Lake Neighborhood Council election results saw the exodus of vocal and long-serving road diet critics. Anne-Marie Johnson and Betsy Isroelit did not receive enough votes to be re-elected. According to Keep Rowena Safe, Johnson had a last-minute conversion to supporting the Rowena road diet, but it was not enough to counter years of vocal traffic safety opposition. Jerome Courshon, arguably the most vocal and most misleading Rowena safety denier, left the board and did not run for re-election. Other road diet critics also did not seek re-election. Several other anti-diet NC incumbents – including Scott Plante and Tony Michaelis – failed to win re-election. Many newcomers were elected to the council under the Silver Lake Progressive slate. Their position is to support the Rowena road diet, to calm traffic on other streets, and to increase the viability and safety of Silver Lake pedestrians and cyclists. After the $88,000 Kimley-Horn study, Councilmember Ryu shepherded council approval of a motion calling for the city Transportation Department (LADOT) to review the study and make recommendations. That motion was approved in November 2018, requesting a report back in 90 days. Earlier this week, LADOT posted their report. 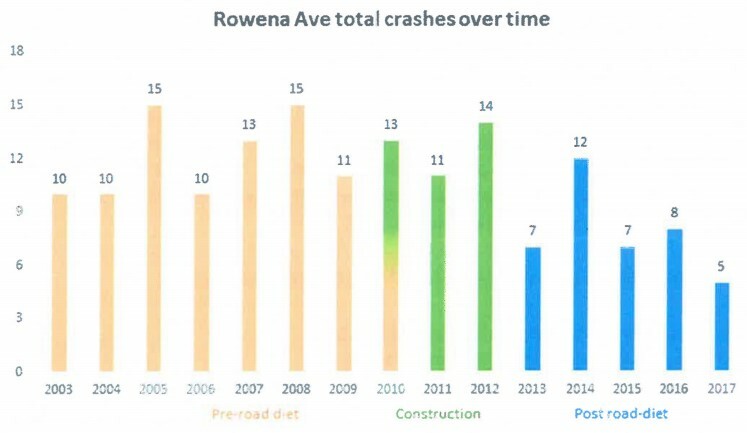 Reduced car crashes: In the five-year period prior to improvements, Rowena Avenue averaged 12.4 crashes per year. From 2013-2017, crashes averaged 7.8 per year. It is worth noting that the Rowena road diet bucked L.A.’s citywide trend. According to Keep Rowena Safe, at the time that Rowena’s crashes decreased 37.1 percent, L.A. city crashes grew 19.2 percent. Reduced driver speeding: 85th percentile speed surveys found that eastbound speeds went from 39 mph to 36 mph. Westbound speeds remained effectively the same, going from 39 mph to 38.5 mph. Consistent car traffic volume: Before and after average daily traffic (ADT) counts remained consistent at approximately 25,000. Increased bicycling: Commute time bicycle counts went from 14 per hour to 71 per hour after the road diet added bike lanes. New turn restrictions to reduce cut-through traffic. This easy low-cost improvement (done nearby but not on Rowena) had been proposed earlier by LADOT, but had been blocked by road diet critics. Silver Lake area safety advocates are also pushing for needed safety improvements in adjacent areas. Most of these efforts have been responses to gruesome car crash deaths, like the one that killed Ashley Sandau on Rowena in 2012. On February 27, pedestrian Christian Vega was killed by a driver turning from Riverside Drive onto Newell Street. Riverside Drive is more-or-less the border between Silver Lake and Elysian Valley. When Elysian Valley community leaders hosted a vigil for Vega, Silver Lake neighbors supported the event. LADOT has responded to the death with intersection upgrades, but it is unclear if these worthwhile, but modest, safety improvements go far enough. On January 16, a hit-and-run driver jumped the curb, crashed into, and killed Christina Garcia on Hyperion Avenue. In 2017, the Los Feliz Neighborhood Council had sent a letter to Councilmember Ryu urging he work to improve street safety and manage speeding on Hyperion. In late March 2019, after Hyperion hit-and-run coverage at Curbed, Ryu sent a letter to LADOT asking for recommendations to improve Hyperion Avenue traffic safety. There are also discussions of reviving/reworking safety improvements proposed for Fletcher Drive, which connects Silver Lake with Atwater Village, Glassell Park and the L.A. River. In late 2016, a hit-and-run driver killed pedestrian Ryan Coreas on Fletcher Drive at La Clede Avenue in Atwater. LADOT plans for Vision Zero road diet safety improvements were workshopped, but later shelved. Perhaps as data continues to show that road diets continue to improve safety, traffic safety denier gadfly voices will recede. This will allow for Silver Lake and other communities to plan and implement much-needed safety upgrades. Wow. It took a councilmember TWO years and a news article to FINALLY get him to make a request LADOT make improvements. Shameful. The Los Angeles Mobility Plan 2035 calls for adding bicycle lanes to Glendale, Silver Lake, and Hyperion. I asked at a Neighborhood Council why we must wait another sixteen years for some lanes but got no response. The Rowena bicycle lanes would get a lot more traffic if they connected to — you know — a network of lanes. KeepRowenaSafe’s endorsements included Scott Plante and Tony Michaelis. Why are they noted here as anti-diet? Earlier Plante and Michaelis voted against or signed on to statement/s against the Rowena road diet. They did have (similar to Johnson) last-minute conversions. LADOT included a tepid new alternative. Attendees favored none of the above. Another meeting is coming up.